Ohaiyo! Reviewing Etude House products today! The previous time I discovered lip tint for the first time (IKR) so I was happy they sent us a new one! One thing with Etude House is that they have super cute packaging! This peach/salmon shade is OR201! It's actually more sheer than the previous range I was sent, so it's down to your personal preference! I applied it on half of my lips (I realise how visible & hence how stupid it looks in pictures below). It's visible that half my lips have something on them, but the colour itself (supposedly peach) isn't that distinct. So it gives your lips a glossiness, but not really a particular color. Another item I was excited to find in the box... solid perfume! The Sweet Cake Fragrance comes in super cute packaging (again)! Perfume is one of the "touch-up" items that is hard to bring around for fear of spills or breakages. But when you have a long day you wanna still smell fresh & nice throughout! Oh & for traveling too! For my recent trips I brought a small sample bottle but those don't have the spray nozzle so it's annoying to unplug it each day (always gets on my hands) & the amount inside is quite little (5ml). The inside of the tub (?) has a mirror so you can use that too for your makeup touch-ups! You don't need a mirror to apply the cream (I rub it on both sides of my neck, below the ears). Oh & it doesn't smell like cake hahaha (in case you were wondering). When they say "sweet cake fragrance" I think they mean the texture. Like... "she's all caked up with makeup" or "your makeup looks cakey". So it refers to like, the texture of foundations. Anyway it smells super sweet & feminine! Here's how it looks like when you wipe the cream! I love this cause it's super convenient to bring around. The tub is really thin & the mirror is useful too. Next up - nail polish remover! And the biggest test is glitter polish, which you can see (uglily chipped) on my nails. Glitter nail polish is SO HARD to remove ugh. The nail polish I'm wearing is from Etude House as well! We were in their store in Seoul & one of the other girls was fascinated with their pastel rainbow glitter polish so she bought 2 or 3 bottles & forced me to apply it LOL. One cotton pad for one hand! That's pretty good for glitter polish! Here are some of the Etude House nail polishes I've accumulated; they all have different packaging! And here's a clear picture of my moustache crop t-shirt from Bangkok (Platinum Mall)! I was also sent this huge box for their new Wonder Pore skincare range! In this box is a facial foam & toner. The Wonder Pore Freshner is actually their original product that proved really popular in Korea, so they are now introducing the facial foam & clay pack to further clear residue from pores! The Wonder Pore Whipping Foaming (strange name, I know) cleans pores, moisturizes & tightens skin. You can use either the Pore Brush or your hands to apply the foam to your face! Next I tried the toner (which normally comes after facial wash)! I love the bottle because it comes with a special pump dispenser! So far I only see this type of bottle for nail polish removers, so that manicurists can easily get more remover with just one hand. Some makeup removers come in this bottle too, but they don't seem common. It makes so much sense though! Annoying times when you have to flip the bottle over & too much/too little comes out. Washed off the facial foam then pumped the Freshner! I really liked the toner because it's extremely gentle. Most toners tend to sting my skin (I have sensitive skin), especially popular brands like Clean & Clear. I find these toners way too harsh & drying so I never use them. Even for gentler toners they do still tend to be a slightest bit sensitive around the eye area. For this toner I had no issues whatsoever using it to clean up residual eye makeup! No stinging or fumes or anything whatsoever. Etude House even recommends that you bring this toner out with you! It comes in a mist-spray container as well, so you can spray it on your face to remove oily shine or any other skin irritations. That's how gentle it is! Can spray directly unto your face & leave it to soak in! The combined use of their facial foam + toner left my skin feeling very soft & clean so I loved it. I dunno which is the one that's responsible for this feeling LOL. Or whether it's both. 10 comments on "Etude House"
The colour of the lip tint sure came out different..
Ohh i love etude house!! Ohh i love etude house! I can tell that you love it from your post! very thorough and detail! 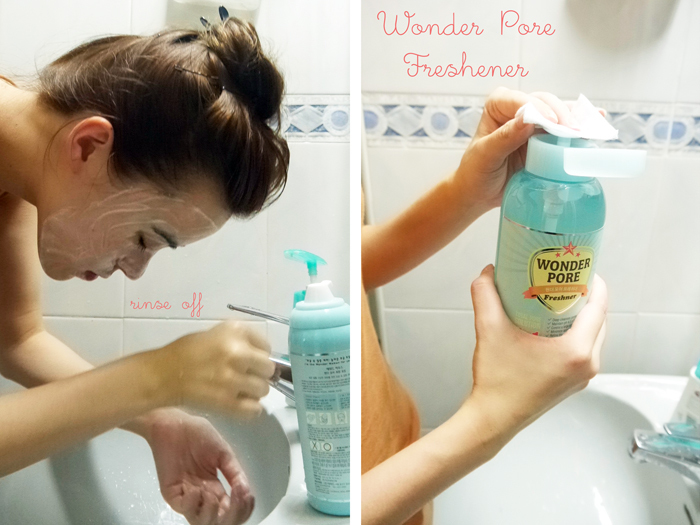 I love the wonder pore as well! my fav item so far! Isn't Etude House a Korean brand? So you should have said "Annyeong-haseyo" instead of "Ohaiyo" right? Just saying. This is soooo cool! especially the perfume! I adore etude house, it's a great brand! Do we need to subscribe for the étude house box each month? Thxxx! !